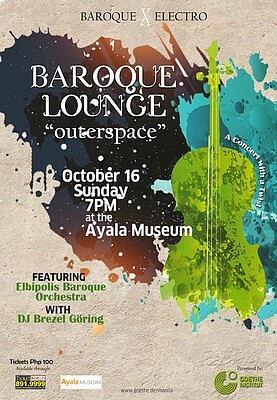 Baroque X Electro: An unlikely marriage of sounds is what the experimental concert Baroque Lounge: outerspace is all about. The Hamburg baroque orchestra Elbipolis and experimental musician/DJ Brezel Göring are flying to Manila to join forces for a one-night concert of musical fusion on October 16, 7 p.m., at the Ayala Museum. Witness an unexpected musical performance that can be dubbed as both classical and inventive! Tickets are priced at P100.